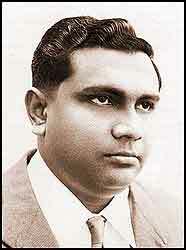 He is the eternal hero of Maldive independence. He ranks alongside the only other such hero in the recorded history of the Maldives, the King Kula Ran Meeba Audha Keerithi Katthiri Bavana (Dom Bandaarain) who ended the occupation by the forces of the Ali Raja of Cannanore in the 18th Century. Rannabandeyri Kilegefan is a descendant of the Hilaaly King Manoel Dhirikusa Loka and the Diyamigily King Kula Ranmani Keerithi (Mohamed Ghiyathuddine). When Ibrahim Nasir Rannabandeyri Kilegefan relinquished the position of the President of the Republic in 1978, for the first time in recorded Maldive history, the head of state of the Maldives ceased to be either a King-sultan (Queen-sultana) or a descendant of a King-sultan. A living Maldive treasure, the Kilegefan now resides in self-imposed exile in Singapore. Two of his children, both now deceased, attended school in Great Britain before the Maldives became a member of the Commonwealth. In 2001, four Maldive nationals applied for political asylum in the United Kingdom. "Today's Commonwealth is a world away from the handful of British Dominions which were the first Commonwealth members. It is a unique family of 54 developed and developing nations, a voluntary association of independent sovereign states spread over every continent and ocean. From Africa to Asia, from Pacific shores to the Caribbean, the Commonwealth's 1.7 billion people make up 30% of the world's population and are of many faiths, races, languages and cultures. "The modern Commonwealth gradually evolved out of United Kingdom's imperial past, mainly through decolonisation, the effects of two world wars and changing patterns of international relations. Today it helps to advance democracy, human rights and sustainable economic and social development within its member countries and beyond. With a common working language and similar systems of law, public administration and education, the Commonwealth has built on its shared history to become a vibrant and growing association of states in tune with the modern world." The Commonwealth may be "a voluntary association of independent sovereign states". Nevertheless all members are not equal in terms of membership rights. 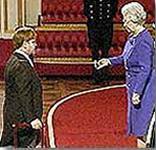 The Head of the Commonwealth is always the head of state of the United Kingdom and other countries, such as New Zealand, that share the head of state of the United Kingdom. This in spite of the fact that there are traditional rulers in other countries of the Commonwealth. Examples of such countries are Malaysia, Brunei Dar es-Salaam, Swaziland, Lesotho, Tonga and Samoa. In all other international associations of states there are systems of rostering the presidency among member states. The Maldives regained control of its external relations from Great Britain in 1965. This event was called independence. Upon gaining independence, His Majesty the Sultan's Government headed by the Prime Minister Ibrahim Nasir Rannabandeyri Kilegefan (N.G.I.V) declined to be part of the British Commonwealth of Nations because the Prime Minister considered it beneath the dignity of the Maldive Kingdom. 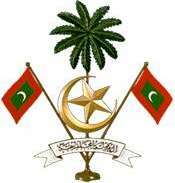 It was only in 1982 that the Maldives applied for and was granted membership of the British Commonwealth of Nations. That was during the tenure of the regime that is still in power in Malé, since 1978. As a consequence, today, Her Majesty Elizabeth II by the Grace of God of New Zealand and of Her Realms and Territories beyond the Seas, Queen, Defender of the Faith, Head of the Commonwealth is, in a manner of speaking, nominally (for want of a better term) "suzerain" over the Maldives. This is why Maldive envoys to the United Kingdom and other British Commonwealth countries today cannot be called "ambassadors". They are called "high commissioners". High commissioners are envoys sent from one dominion to another dominion within an empire- in this case the empire is the British Empire now known as the Commonwealth. In 1982 the Maldive diplomatic mission in Colombo was called an embassy (usually) headed by an ambassador, as was the Indian mission in Malé- the only mission of a Commonwealth country there at that time. Following the Maldive accession to the Commonwealth these missions were downgraded to high commissions. Grand Cross of the Order of St. Michael and St. George. Like His Majesty's Government of the Maldives, these countries too regarded it beneath the dignity of their sovereign status to be part of the Commonwealth. In 1982 certain influential people in the Maldive regime sent their children to the United Kingdom for private education- several more with the same connections followed later. It was hoped that joining the Commonwealth would make travel to the UK easier for Maldive nationals- similar to what was enjoyed by Her Majesty's subjects in her realms such as New Zealand, Canada and Australia. "The Government is firmly committed to ensuring that visa regimes only apply to those nationalities where there is a clear immigration need. "Having reviewed the regimes on nationals from Maldives, Mauritius and Papua New Guinea it has been decided that these visa regimes are no longer necessary. We have therefore made a change to the Immigration Rules today lifting the requirements for nationals of these three countries to hold a visa before they visit the UK. This change will take effect on 18 December." At that stage Maldivians with a valid passport had a limited visa and entry permit granted automatically at the point of entry to the United Kingdom. Ironically very soon after the Maldives joined the Commonwealth, travel requirements for Maldivians travelling to the UK were tightened. As a result, prior to arrival, Maldivians who travel to the UK were required to obtain a visa issued by the staff of the British High Commissioner to the Maldives. It was also hoped that when influential people of the Maldives travelled to the UK to meet their children, the Home Office and the New Scotland Yard would provide official transport, motorcades and security. Evidently such privileges were extended to officials who travelled privately to fellow member countries of what is now the South Asian Association for Regional Co-operation (SAARC). Soon it transpired that the British government did not waste taxpayers' money on the private junkets of foreign dignitaries. 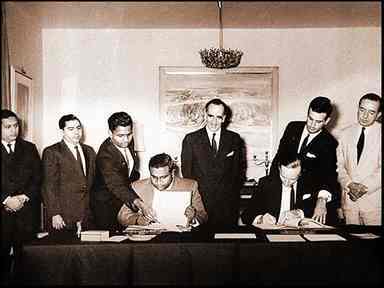 Agreement that gave the Maldives independence. British Ambassador designate to the Maldive Islands. The Ceremony took place at the British High Commissioner's Residence in Colombo on 26 July 1965. Standing from left to right in the Maldive delegation: Mr Koli Ali Maniku Maldives Trade Representative in Colombo; Mr Kandi Ahmed Maniku, First Secretary Maldive Embassy in Colombo and Abdul Sattar Faamuladeyri Kilegefan Maldive Ambassador designate in Colombo. 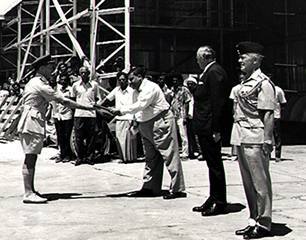 Gan (Addu Atoll) handover ceremony 29 March 1976: Flanked by the British Ambassador to the Maldives, Vice President Koli Ali Maniku receives the handover of Gan from Group Captain W. Edwards of the Royal Air Force. For the next two years, March 29 was marked as the Maldives Independence Day until reverted back to July 26. Just above the Group Captain's forearm is Mr Kakaagey Ali Didi who was appointed as official in charge of Gan. He was later to become Majid's father-in-law. On the far right, partially concealed behind a British officer is Mr Ahmed Adam, affectionately known as "Manager" to his subordinates.